Please be sure to be back at the place you were dropped at the following times to catch the bus. Please be aware that there may be a little bit of a wait due to traffic. All Day Hop On Hop Off Ticket: $35 per adult, and $25 per child 12 and under. Your ticket is good for unlimited on/ off all day the day of purchase. $3 discounts are also offered on all day tickets for college students, military, seniors, firefighters and police officers. Single Loop Ticket: $25 per adult and $19 per child 12 and under. Same great tour, just no hop on hop off. Tickets can be purchased on our website or at any of the stops directly from the tour guide. Please arrive at least 10 minutes early as we will depart promptly at the start times. Unfortunately, all parking downtown is paid parking. 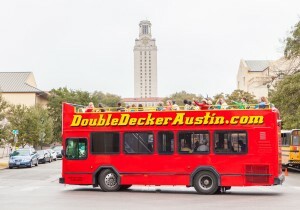 Parking for Austin Visitor Center is available at E. 5th St, Convention Center Parking Garage. The entrance to the parking garage is on E. 5th St and cost $6 for 3 hours and $13 for all day. Don’t forget your sunscreen and hat! Infants and lap babies must be secured to their parents via a harness to sit on the upper deck. If you miss the bus, sorry. We do not provide special pick up. You can wait until the next pick-up time, or call Austin Cab company at 512-478-2222. We do not operate on the following holidays: Thanksgiving, Christmas Eve and Christmas Day, Easter Sunday, or New Year’s Day. We do not operate the Double Decker on days we cannot maneuver safely around town due to street closures, the rain, or in inclement weather. Please notify us 24 hours in advance for wheelchair access. Wheelchairs must be 28″ or less wide. Of course, you will receive a full refund if WE must cancel the tour for any reason. You will be given a full refund if YOU cancel within 24 hours.